A work jacket, with a little bit of a western flair. This jacket offers the softness and durability of the Sandstone duck exterior and the warmth of Carhartt's quilted flannel lining. Back length - Large Regular: 28"; Large Tall: 30"
Only a person who owns a Carhartt jacket can appreciate what I am about to say. I work in an office and this is my fourth jacket. All my 12 oz jackets (3) keep me warm in freezing temps. They allow me freedom of movement because the sleeve length interior is cut larger. I love that. My spring/fall jacket makes for an easy transition. Because the 12 oz are so heavy when wet I wash them at the local laundry mat. They break in nicely too just like your old baseball glove or a good pair of shoes. Like I said before, I wear them for work. They are actually my main coats during winter. I wear them at night and on the weekends even when we go out to dinner. I have one jacket out of the group that is my main labor jacket. I get it real dirty, wash it and other than a little fading it looks great. Oh.......another thing, I've never ripped the fabric that's how tough they are. got it caught on nails, wood splinters. Not surprising. Like all Carhart products, this jacket meet and exceeded my expectations. This Sante Fe Jacket/coat is exactly what I wanted. I bought the dark brown version. Its warm, is great looking, for casual wear, along with the usual Carhartt quality. I wanted this for casual use only (I already have lots of Carhartt "stuff", for foul weather, so I didn't really need another coat) . It is virtually wind-proof, just like my other Carhartt coats and jackets. Fit is great, the western styling is really good looking, and "fits" my personality. It was well worth the money, and deserves the 5 star rating. I'd recommend it to anyone. g!ot this jacket a couple of weeks ago and the weather has been around zero ever since. the jacket is very warm and cuts the wind great. very comfortable with two nice inside pockets. it also has snaps fora hood. too bad its a closeout. get one if you can! jacket has a great zipper. this is the second one of these jackets I have purchased. i liked the first one so much I replaced it after 5 years. fits like a glove. very warm and comfortable. highly recommended. I have worn Carhartt jackets for years as a work jacket and needed a new one that was more for going out. This was a real nice fall and winter jacket and a real nice casual jacket it is super comfortable. As far as I'm concern your prices, quality of goods and customer service are what made the difference to me, which keeps me coming back! Best fall and winter jacket I have ever had and wear, it is super comfortable as far as I'm concern, I'm on my second one now which I order as a spare for when the one I'm wearing the fabric will fade away. 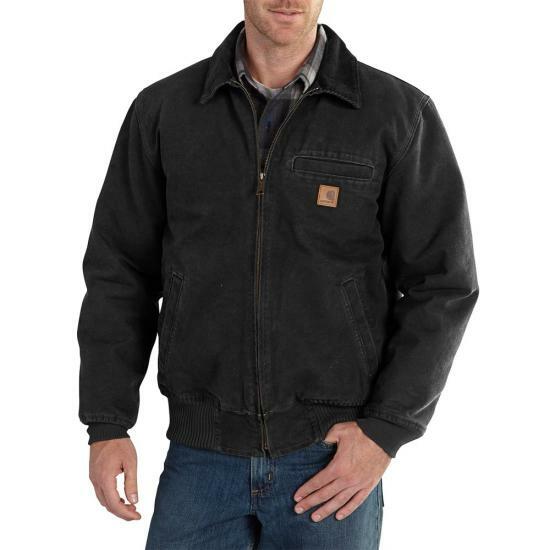 This jacket is to replace a similar older Carhartt jacket that my husband has worn for years. This new jacket is very well made and improved from his earlier jacket with inside pockets on both sides. The quilted lining is even warmer than the older jacket. He loves it and I would recommend it to anyone that needs a new warm jacket. Everything we get is great. The only this that we have noticed is that the vests run one size smaller for us. We ordered about a dozen so far. 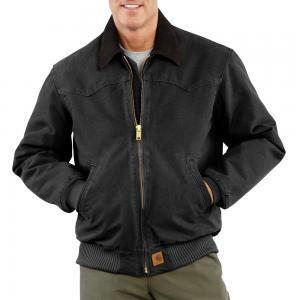 To me this is the best jacey carhartt makes its thick comfortable and doesn't have a hood on it that gets in the way. I own two of these jackets on for work and one for dress. Western shaped front and back western yokes Pleated elbows Corduroy trimmed collar with snaps under collar for optional hood Back length - Large Regular: 28"; Large Tall: 30"